Nordic mobile goliaths Nokia have unveiled an upgrade for their Nokia 770 Internet Tablet which gives the chunky device VoIP and instant messaging capabilities through Google Talk. Despite the enthusiasm from Ari at the launch for the upgraded Nokia 770, he insisted that the technology wasn’t expected to cut into the market of traditional mobile telephones. “I would not say this kind of technology competes with traditional mobile telephony. There will always be stand-alone devices where telephony is the main function,” he said. Originally unveiled in May 2005, the Linux-powered Nokia 770 was the company’s first non-phone mobile device, designed for users to access the Internet around the home over a wireless broadband connection. Customers who already have bought the 770 can upgrade their device to use the new Google Talk features for free over the Internet. The newly introduced OS 2006 edition with Google Talk pre-installed gives users access to Google’s free instant messaging service so they can chat and make calls through the Internet on the 770. The updated OS also boasts enhanced text typing with full-screen finger keyboard, improved memory performance and a ‘refreshed’ look (did they throw a bucket of water at it, or something?). 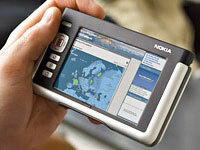 The upgraded device is expected to knock out for about €370 (US$470), Nokia said.